All mosquitoes develop in still or very slow moving water. They evolve through four stages: egg, larva, pupa and adult. There are at least fourteen species of mosquitoes found within our District. Some mosquitoes lay single eggs, which float on the water’s surface. Others species lay their eggs in batches, which float on swamps and ponds. The most pestiferous mosquitoes lay eggs on damp ground. The eggs hatch with accumulated rain, rising river currents, or the flooding of irrigation water in marshy ponds, ditches, woodland pools, and irrigation fields. Eggs can remain viable for several years and not all will hatch during the next flooding. Mosquito larvae live just below the water’s surface, breathing directly from the surface by means of a siphon tube, located on the rear of their bodies. Larvae feed on small organic particles suspended in water. They grow by molting four times, with the final molt resulting in a non-feeding pupal stage. After the transformation is complete, the new adults split the pupal skin and emerge. The development of larvae to adult stage requires 6 to 10 days, depending on the water temperature and the mosquito species. Usually adult mosquitoes are less than quarter of an inch long, with long slender legs and a single pair of wings. They can be distinguished from all other flies, by the presence of a long piercing mouth part (proboscis), and scales along the wing veins. To mate, the male mosquitoes form swarms that attract female mosquitoes. The female's high-pitched humming beat of their wings enables the males to easily locate them. Generally, female mosquitoes mate only once in their lifetime. Afterwards, some species remain within a few hundred feet, while other species will disperse over many miles. Most male mosquitoes live for a week however most females may survive for a month. While both male and female mosquitoes feed on nectar from flowers, only the females need a blood meal for egg development. Female mosquitoes are attracted to carbon dioxide, odors, moisture, and body heat all of which people give off in quantity when active. Female mosquitoes deposit 75 to 500 eggs in a single batch. Most mosquito species will survive the winter in the egg stage. Although some may spend the winter, as hibernating adults, in a protected location. The Aedes vexans, Ochlerotatus dorsalis, Culex tarsalis, and Culex pipiens are the most common species found in the Grand Valley. Introduction: This inland floodwater mosquito can be characterized by its distinctive physical features that give it a “warrior like” appearance. The adults are black and brown with white and grey markings, and they possess a distinct tip at the base of their abdomen. These tiny warriors will attack and bite ferociously, especially at dusk. In the Grand Valley these mosquitoes dwell in heavily irrigated pastures, as well as along the floodplains of the river bottom. Life Cycle: In the late fall the adult female will lay her eggs in areas that have a history of holding flood water, which are referred to as floodplains. The eggs are laid singularly either on the ground or on dried up vegetation, and are protected with a strong exterior that keeps them safe throughout the winter. In spring, as irrigation and rising river water are introduced to the dry floodplains, the eggs are soaked and within 3-5 days a larvae will hatch. The Aedes vexans mosquito begins hatching early in the spring, however many generations may occur throughout the summer, with a new brood hatching about every 18-24 days dependant on flood patterns. Habitat: A. vexan larvae occur in a wide variety of habitats, however in the Grand Valley it is common for this species to occur as a result of pasture irrigation. This habitat provides a large, known flood plain and exposure to direct sunlight which accelerates that mosquito lifecycle. Brackish waters in the river bottom often contain large numbers of A. vexans that are introduced to runoff waters via the river in the early spring. Finally, at the base of the Bookcliffs, there are pools of water that form during runoff or heavy rains that can produce large numbers of very aggressive mosquitoes. Disease: Mosquitoes have the ability to transmit pathogens that cause some of the worst diseases in the world. This particular species of mosquito is no exception, as it has been shown that they transmit Western Equine Encephalitis, California Encephalitis and dog heart worm. Control Methods: Due to the nature of the breeding locations, the insect growth regulator Altosid would be applied followed by the bacterial larvicide Bacillus thuringiensis (BTI). Introduction: The Ochlerotatus dorsalis mosquito is sometimes referred to as the ‘Pale Marsh’ mosquito due to its light coloration and its propensity to prefer areas where brackish water is present. Known for its salty personality, this mosquito is an aggressive biter that tends to bite most fiercely in early spring. In the Grand Valley this mosquito will be found near the river bottom, occasionally near desert water holes, and in heavy agricultural areas. Life Cycle: In the late Fall the adult, female, O. dorsalis, mosquito will lay her eggs in areas that have a history of holding flood water. These areas are referred to as flood plains. The eggs are laid singularly either on the ground or on dried up vegetation, and are protected with a strong exterior that keep them safe throughout the winter. In spring, as irrigation and rising river water are introduced to the dry flood plains, the eggs are soaked and within 3-5 days a larvae will hatch. While the O. dorsalis mosquito is most prominent in the spring, several generations may occur throughout the summer, a new brood hatching about every 18-24 days dependant on flood patterns. Habitat: O. dorsalis larvae occur in a wide variety of habitats, including both fresh and alkaline waters. In the Grand Valley it is common for this species to occur as a result of pasture irrigation. This habitat provides a large, known flood plain and exposure to direct sunlight which accelerates that mosquito lifecycle. Brackish waters in the river bottom often contain large numbers of O. dorsalis that are introduced to runoff waters via the river in the early spring. Finally, at the base of the Bookcliffs, there are pools of water that form during runoff or heavy rains that can produce large numbers of very aggressive mosquitoes. Disease: Mosquitoes have the ability to transmit pathogens that cause some of the worst diseases in the world. This particular species of mosquito is no exception, as it has been shown that they transmit both California Encephalitis and dog heart worm. Due to the nature of the breeding locations, the insect growth regulator Altosid would be applied, followed by the bacterial larvicide Bacillus thuringiensis (BTI). Introduction: The Culex tarsalis can be separated from other species of the Culex genera by the median banding on the proboscis, as well as the wide basal and apical bands on each tarsal segment. They are golden brown in color and possess a blunt rather than pointed abdomen. The Culex tarsalis are locally abundant and are persistent biters that are most active at dusk and after dark. Life Cycle: Females hibernate through the winter in secure locations. In spring egg rafts containing approximately 190 eggs are laid in newly created sunlit pools that are frequently surrounded by grasses and annual vegetation. Larvae will hatch off in 3-5 days depending on the temperature of the water, with several generations occurring throughout the summer. Habitat: Larvae of the Culex tarsalis tolerate a wide range of water conditions including agricultural tail waters, alkaline lake beds and fresh and saline wetlands. Although they don't prefer to breed in water that contains organic pollutants they are known to dwell in permanent standing water, which includes ponds, ditches, and artificial containers. Disease: This species of mosquito is probably the most prominent vector of arboviruses in North America. After emergence in early spring when mosquito populations are low the females will primarily feed on birds. However, as mosquito populations rise later in the summer, bird mosquito avoidance behavior diverts many to begin feeding on small mammals, livestock, and man. This shift in hosts may account for an increase in viral transmission of West Nile Virus, Western Equine encephalitis and Saint Louis encephalitis, among many others. Due to the nature of the breeding locations this species of mosquito should be carefully monitored, and a strict application of the bacterial larvicides Bacillus thuringiensis (BTI), and Bacillus sphaericus should be utilized. Introduction: The Culex pipiens is the most widely distributed species in the world, and can be found on every continent except Antarctica. The adult female is golden brown and can be recognized by its blunt rather than pointed abdominal tip. This species of mosquito has shown great skill in finding ways to get into homes where it feeds on their occupants at night. It is for this reason that it known as the “Northern House” mosquito. Although females of this species will also feed outdoors they prefer to shelter themselves in protected locations. Life Cycle: Females hibernate through the winter in protected locations such as cellars and basements. In late spring they will lay rafts that contain several hundred eggs which will float on top of the water for 3-5 days before hatching, after this first brood several generations will occur throughout the summer. Habitat: The larvae of Culex pipiens prefer water that contains organic pollutants. It is for this reason that they can be found breeding in such location such as catch basins, storm drains, rain barrels, ponds, and sewage treatment effluent. Disease: This species of mosquito is a vector for many diseases including Saint Louis encephalitis, Western Equine encephalitis, Dog Heart Worm and West Nile Virus. Control: Due to the nature of the breeding locations this species of mosquito should be carefully monitored, and a strict application of the bacterial larvicides Bacillus thuringiensis (BTI), and Bacillus sphaericus should be utilized. 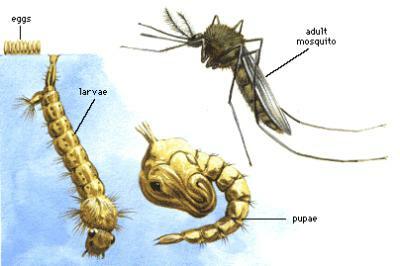 Introduction: Anopheles Mosquitoes are notorious for spreading Malaria throughout the world. Fortunately, we no longer fear the threat of Malaria in Colorado, but we do have the Malaria mosquitoes, in low numbers, in the District. These mosquitoes are usually not caught in our traps and represent only a small proportion of the mosquitoes of the Grand Junction area. They are easily identified by their long palpi and dark scale spots on the wings. There are two species found in the District. Life Cycle: Both male and female mosquitoes survive over winter. The female deposits eggs on the surface of the water individually. The eggs float laterally on their sides supported by a float on each side of the egg. The larvae are easily identified by floating parallel to the water surface just under the surface of the water. Habitat: The larvae of anopheles prefer water that contains organic pollutants. They can be found developing in such location such as roadside ditches, seeps, and water containing ample vegetation and exposure to sunlight. Disease: This species of mosquito is a vector for many diseases including Malaria and Western Equine Encephalitis Virus. Control: Due to the relative low populations, adult Anopheles mosquitoes rarely exceed threshold populations that require treatment. A regiment of the bacterial larvicides Bacillus thuringiensis (BTI), and Bacillus sphaericus should be applied to breeding habitats where larva are identified. Other mosquito genus that we find include the Culiseta. This genus is represented by three species here in the District. This group of mosquitoes are much larger in size than most of our other mosquitoes. They are large and have a blunt terminating abdomen like the Culex mosquitoes and have a downward curve of the proboscis. The most common Culiseta in this area is the Winter Marsh Mosquito. It tends to have a larger presence in the District during the beginning and end of the season. A very unusual type of mosquito for our area is of the Psorophera genus. We had not seen this genus of mosquito in the valley prior to the year 2012. Some seasons we do not see any of this type of mosquito in our traps. They are very easily identified by the distinct color banding on the fringe of their wings. There are several species of Aedes mosquitoes found in the district that are not particularly abundant or there are only found for a short time. Aedes increpitus is a mosquito found in the first few weeks of the year and usually in the Redlands area. Many other Aedes mosquitoes are very common on the Grand Mesa but are rarely found at elevations below 7000 ft.
One insect that is often mistaken for a mosquito is the Crane Fly. People often see them inside of their houses on the ceiling and walls. They look like giant mosquitoes. It is easily identified as not being a mosquito by the lack of a long feeding tube (proboscis).